We invite you to visit Merry Lea and experience its natural beauty and varied ecosystems. 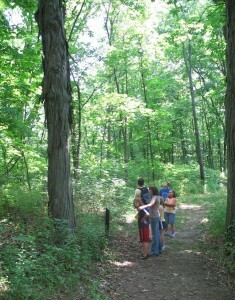 As part of its mission, Merry Lea provides “re-creating opportunities that benefit the human body and spirit while not exploiting the land or excessively disturbing its ecosystems.” Visitors are welcome to hike the trails, view exhibits in the Learning Center Building, participate in public programs and purchase nature-related materials at the bookstore. Merry Lea has eight miles of hiking trails that are open every day of the year from dawn to dusk at no charge. The trails pass through a variety of ecosystems and provide opportunities to explore the ecological features of the land. Merry Lea has two trailheads located at the Farmstead Site and the Learning Center Site. They are marked with a star inside an orange circle on the trail map. Please begin your hike at either of these locations. Trail maps are also available at trailhead boxes. The nature center in the Learning Center contains hands-on displays of animal skeletons, firs, birds, rocks, and other natural items. In the summer, you may see butterflies and the occasional hummingbird in the garden outside the east windows. In the winter, many songbirds come to this same area to eat from the various bird feeders. Binoculars are available for indoor viewing. The nature center is generally open weekdays from 8:30 to 4:30; however, visitors are advised to call the office to confirm hours (260-799-5869). During workday hours, visitors may use the restrooms in the Learning Center or Rieth Village Office. During April through October, porta-potties are located at the Learning Center and Kesling Farm trailheads. The bookstore is generally open weekdays from 8:30 to 4:30; however, visitors are advised to call the office to confirm hours (260-799-5869). Please observe the following guidelines when visiting/hiking at Merry Lea. Leave all plants, mushrooms, and animals undisturbed. Trails are maintained for foot traffic only. Biking, horseback riding, all-terrain vehicles, and snowmobiles are not permitted. Cross-country skiing is allowed on the trails when weather conditions allow. Trails are not groomed for skiing. No public hunting, trapping, or discharge of firearms will be permitted within the borders of Merry Lea. Waterfowl hunting on the lakes bounded by Merry Lea property is to occur from public waters and not from within Merry Lea boundaries. Merry Lea property may not be used as a general access for ice fishing. Crossing through Luckey’s Landing on foot to reach High Lake is permitted. Parking is permitted only in designated areas. Driveways, roadways, and gated field entrances are not appropriate parking spaces. Unauthorized fires are not permitted. Dumping or littering is not permitted. Visitors are strongly discouraged from bringing family pets because their presence is disruptive to the native animals and plants. In addition, most hikers at Merry Lea come expecting to experience a natural setting. Any dogs and cats must be under direct control at all times. Use of alcohol, tobacco, and illegal drugs while at Merry Lea is not allowed. Bird migration: Visit any of the wetlands and lakes to see waterfowl. At Onion Bottom, an observation tower (between points N and J) provides excellent viewing of birds arriving for the summer and those passing through. Wildflowers: Spring ephemeral wildflowers are abundant in the woods. Aquatic life: The vernal pond (close to point F) is teeming with life in the spring. Visitors may use the dippers but need to return them to the storage cabinet by the dock. Organisms may not be taken away front the vernal pond area. The coolness of the woods: Far from the heat island effect of built environments, enjoy the shaded coolness of the wooded trails. Refreshing water: Dip you toes into High Lake at Luckey’s Landing. Flowers: Meadows and prairies are in full bloom in late summer. Colorful leaves: Maple, sassafras, and sumac leaves turn bright colors. Tree skeletons: In late autumn after leaves have fallen, observe the distinctive shapes formed by tree branches. Lively hikes: Fall hikes can be filled with sound as newly fallen leaves crackle and crunch underfoot. Expanded views: When the deciduous trees have shed their leaves, hikers can see across the landscapes and experience a feeling of openness in the woods. Animal tracks: Observe animal tracks in the snow and find out what a busy place Merry Lea can be even in the winter’s cold. Winter birds: See what birds are attracted to the bird feeders outside the Learning Center building.